What modding did you have to do to get them big boys to fit? Also has affected your turning circle any? Absolutely fantastic, what a difference!!!! Looking good mate is that 15x10 wheels and what size of tyres have you got on them ? i am fitting 15x10" wheels with 33x12.5x15 tyres on to the disco. Also what make of tyres are they and were they expensive ? You just looked at the pretty pictures didn't you!! Are you going to get them beadlocked? or run as is? I will get the beadlocked at some point but its all money at the moment just means that i wont be able to run them at low pressure going to order the wheels this week. no i wont be geting them beadlocked for now anyway, ive aired mine down to 20 psi and there still hard as hell, What tyres are you buying Steve? 33" on the disco wow that would be good, youle have to get extended wheel arches and a lot work with the grinder, ive seen some that are on icelandic snow landys that look real wide and strong, just have to find some? any body no? The Kumho Road Venture MT KL71 was the joint winner of 4x4 Magazine's 'ultimate tyre test' to establish the best mud‑terrain tyre on the UK market. It shared top honours with a BFGoodrich, beating offerings from Goodyear, Wildcat, Maxxis, Cooper, INSA and Pirelli by a significant margin. All eight makes of 235/85 R16 tyres were subjected to six challenging, real‑world tests, ie ‑ mud climb, bog run, side slope, rock crawl, gravel and tarmac braking. One vehicle was involved - a 2007 Land Rover Defender 110. The magazine found the Kumho KL71 radically different in appearance from all its competitors and, in fact, to be the best looking as well as the joint best performer. The Kumho was awarded top marks on the rock crawl and gravel braking tests and performed with credit on the mud climb and bog run. In summary, the magazine said, "The Kumho MT KL71 is a great tyre and a deserving all‑round winner. Give it a try." Said Kumho's Managing Director Steve Tidmarsh, "We are naturally delighted with the result. 4x4 Magazine's test is very much in line with our own research and reinforces the confidence we have had in the KL71 from the outset. 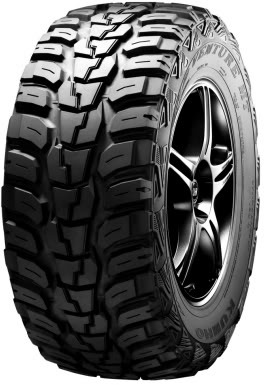 I can also reveal that the new 18in rally raid tyre we have developed for the Bowler Nemesis is based on the KL71 and that is surely the ultimate test for an MT tyre." They are also a very good price. I was looking at the tyres on paddocks and for 33"x12.5"x15 they are £81 + vat i have found them cheaper on other sites but you get free postage on paddocks if you spend over fifty squid. just need wheel arches now!! just copy and paste the url on the page you are looking at buddy. We can expect pictures around May 2010 then lol! Well its not raining today and the sun even made a short appearence. here goes, front typically LR stiff, needing to think about that, backs okish but stll not enough for me, possibly shock drop mounts but what goes down wont go up as much, so maybe a gwyn lewis rear higher shock mounts and plus 5.5 shocks.